Author’s copy. 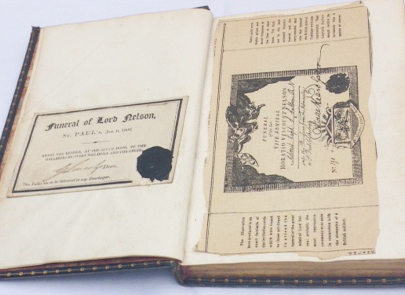 First edition, 8vo, half cloth, marbled boards; With supplementary additions of a ticket to Lord Nelson’s funeral, an ALS to the author from Admiral Sir Robert Calder (1745-1818) and a fragment of the Union flag flown by Victory at the battle of Trafalgar secured by the author at the funeral of Lord Nelson in January 1806. Lawrence Hynes Halloran (1766-1831) was a bit of a rogue. Apparently born in Ireland, an early career in the royal navy ended abruptly when he was imprisoned for stabbing to death a fellow midshipman. He then pursued a haphazard career as a schoolmaster and hack journalist before setting himself up as a clergyman, without the necessary training. He returned to the navy as a chaplain and was present in HMS Britannia at the battle of Trafalgar where he was seen relaying orders by speaking trumpet from Admiral Lord Northesk, who was third in command to Nelson. 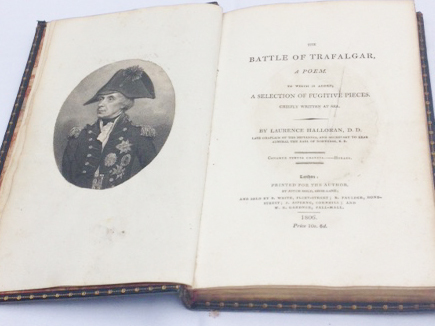 After the battle he published “A sermon on occasion of the victory off Trafalgar, delivered on board HMS Britannia at sea, 3 November 1805,” and ‘The Battle of Trafalgar, a Poem’ (1806). 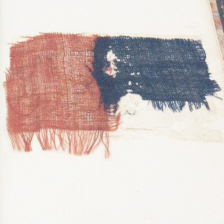 He also attended Nelson’s funeral at St Paul’s Cathedral on 9 January 1806 where he acquired this fragment of the Union flag from HMS Victory. 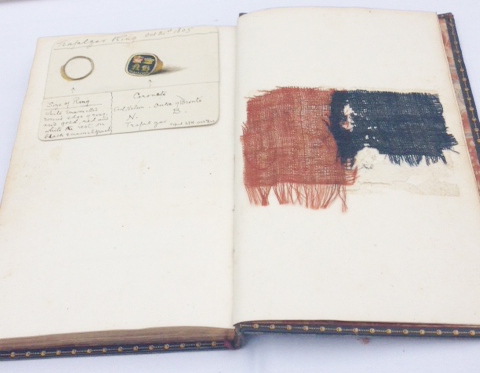 The flag was famously torn up by veterans of the action in the cathedral vault before it could be interred with Nelson. After years avoiding creditors and the church authorities, in 1818 Halloran was charged with forging a frank on a letter and transported to New South Wales. Here he established a school (Sydney Free Public Grammar School which still thrives) and resumed his litigious journalism. He died in 1831.